Our pastor’s mother had recently fallen and broken her hip. As part of her recovery, she moved in with her son, our pastor, and his family. To aid in the transition, the church arranged to provide meals. I signed up for Sunday, April 2, 2017, and asked the Lord what He wanted me to do. During worship that Sunday morning, the Lord answered in the form of what I can only describe as a video that played in my head. The first part showed the finished result, some kind of cooked meat with lemon slices on top. The rest of the “video” was a step by step demonstration of how to make what I saw, which turned out to be roast pork. Normally, when the Lord gives me a recipe, He reveals what He wants me to do as I go along, with me following each prompt with little to no idea what is to follow (see the introduction to this post for background context). This time was very different. As a result of this worship experience, I largely knew what I needed to do with the exception of the rest of the meal (veggies and potatoes), which came to me when I went to the store. After church, I headed to the store to buy what I needed, which I list here. I had a few items already, but had to buy most of it. Large pork roast. I honestly didn’t weigh it, but it was around 5 lbs. Fresh basil, 2 or 3 sprigs. I bought a package of it and used about 2/3 of the package. 6 to 8 red or yellow potatoes. * The original recipe that the Lord gave me called for cranberry chutney, but I couldn’t find it at the store, so the Lord told me to get Cape Cod cranberry sauce and bacon jam as a substitute. Rinse the roast and pat dry with paper towels. I know it’s not recommended anymore, but I live dangerously and want the roast to be dry and not slimy! Add strips of applewood bacon, enough to completely cover the roast. Cover that with more asiago cheese. You cannot have too much cheese! Add butter, cream, salt, pepper, and thyme. Mash until your arm aches or until all lumps are gone. In my case, both arms ached afterwards. As I made the meal, I could feel some of what God feels for the woman and family I was making this for, especially His love for her and the joy He takes in caring for her. Even bringing the meal to their house was an act of worship on my part as He shared His feelings with me. This special joy is a blessing that God gives to those who choose to serve His children. I would like to close by thanking God for this recipe. For years, I had been looking for a good way to cook pork roast that balanced the need to cook pork thoroughly with the arguably more important need for the meat to not be dry or tough on the one hand, or dripping with fat on the other, which is all too often the inevitable result. To my delight, this recipe turned out to be what I had been looking for, a way to cook pork that leaves the meat thoroughly cooked, yet tender and juicy. It has to be the cheese. 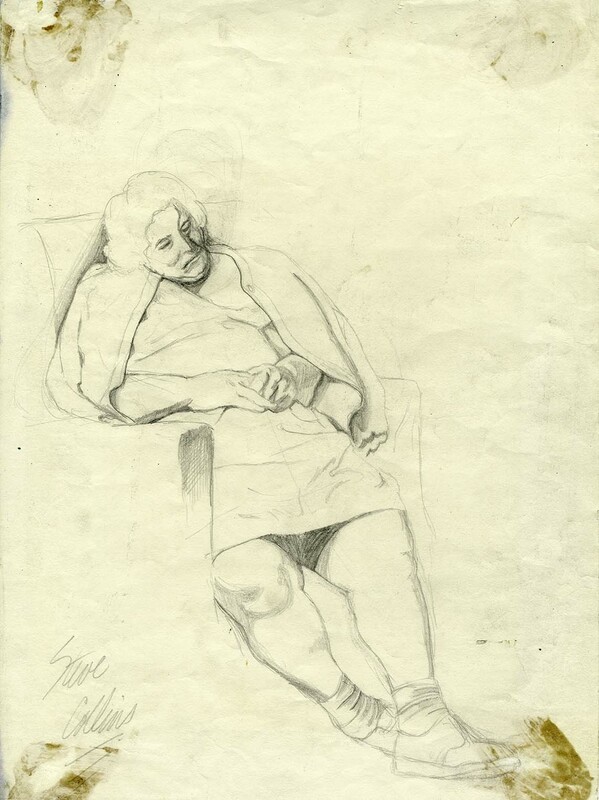 PS: The image I put on this post is a drawing I did of my aunt back in 1970. If you look closely, you will see that her head was erased and redrawn a few times. She passed out while I drew her and I didn't think of the obvious alternative of leaving it the way it was. What can I say? I was young. You can see the whole thing here.